Hyakuhiro Falls (百尋の滝) is located Okutama Town Nippara, Tokyo. It has 40m high and located at Mt. Kawanori. 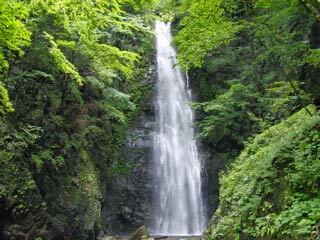 Hyakuhiro Falls is located deep side of Kawanori Valley, but it is one of the highest waterfalls in Okutama area. It is located on the Mt. Kawanori Hiking course. It is middle level hiking course and takes long to time to visit. The half of the way is constructed but another half is mountain road. Be very prepared. During the Koyo season, it has great Autumn leaves.